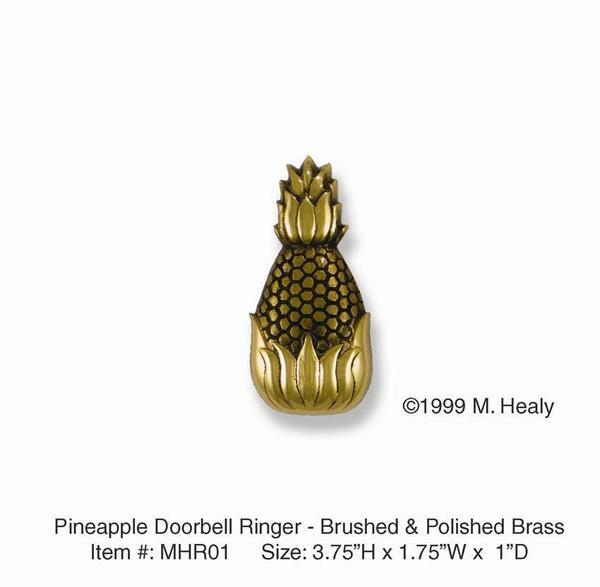 Michael Healy Pineapple Doorbell Ringer Michael Healy - Artistic Decorative Hardware Each Michael Healy Door Knocker is created using the age-old art of sand casting. In this process, an original sculpted model is pressed into firmly packed sand to create a mold. Brass, Bronze and Nickel Silver alloys are then heated to over 2000 degrees and hand-poured into the impression. As the metal cools and the sand is broken away, your original Door Knocker or unique Doorbell Ringer emerges. Each mold can only be used once, making Michael Healy Door Knockers truly unique. After the raw casting undergoes several final phases of polishing and finishing, it is ready to carry the signature of the artist, Michael Healy, ensuring its authenticity and quality craftsmanship.